Being surrounded with plants alone is both invigorating and encouraging. Days and days spent indoors and at the workplace prevent us from getting in touch with nature, thus we tend to have limited means to appreciate everything that’s grand and beautiful in life. Picture yourself being surrounded with plants that teem with life and growth, and their edible parts improve the appetite and nourish the body with essential vitamins and minerals. Having your on little piece of nature can help you get rid of stress. The sight of your vegetable garden alone gets rid of stress by giving you that rewarding feeling, knowing you raised those healthy plants with your own hands. Raking, digging, weeding, pruning and harvesting – all these activities done while planting vegetable gardens provide a constructive outlet for all the tensions that the body amassed during a week of stressful work. Getting enough sunlight while tending your vegetable garden alone will already significantly improve your mood. It’s also a great and productive way to have enough vitamin D, which is necessary for proper absorption of calcium in your body. Try to picture some of the happiest moments of your childhood; it is without a doubt that most of them were spent under the nourishing radiance of the sun. Hours spent at the office means exposure to unnatural light. Not that it is bad to be exposed to light coming from incandescent bulbs, but the lack of being exposed to natural light of the sun is. For sure those skyscrapers are blocking out the sunlight from directly hitting your skin even as you walk to work in the morning. Attending to the needs of your vegetable garden in the backyard is a great opportunity to get enough sunlight. However, it is best if you forgo gardening from 11 am to 3 pm as the sun within this time frame is most likely to cause you irreversible skin damage and cancer. We all know how stress wreaks havoc to our overall health. Aside from the more obvious fact that stress takes out joy and serenity in our lives, it is also the root of many illnesses known to man. The negative effects of stress in our lives can and will bring several problems such as: heart diseases, depression, migraine, eating disorders and many others. Having your own garden in the backyard is an easy and highly accessible method of stress relief. Since a vegetable garden is fairly easier to look after than one with ornamental plants, you know that working on your garden does not simply create additional stresses. The weekends are perfect to unwind and make up for stressful hours during a week-long of taxing hours spent at the workplace. Different people have different ways of getting rid of stress. Imagine if you have a vegetable garden in your backyard; just don your gardening attire, step out and you can immediately get in touch with nature and put behind you the stresses of life. Now compare that to a weekend at the beach. Just the long hours of travel, heavy traffic, and the additional expenses for gas and accommodation will only add to your already stressful life. 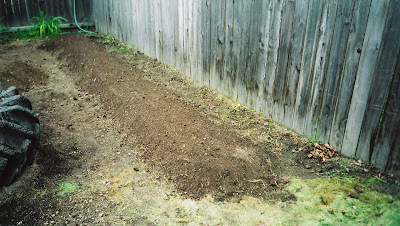 A very important aspect of planting vegetable gardens is preparing the soil. It doesn't matter whether you plan to raise vegetables in a small plot of land or in a plant box. Soil preparation is an essential step. Soil can be categorized as sandy or clay-like, with silt being a fine mixture of both sand and clay. Clay particles in sand help retain water longer as well as make the soil absorb water faster. Sandy particles in soil makes the water flow through it easily and lets the air in so that the roots can breathe. Recently I had a friend who's tomato plant leaves looked like they were shriveling up and he could not figure out why. When I looked at them, it was clear that his plants were suffocating and needed oxygen. His soil needed some sand worked in to allow proper drainage and oxygen. The best way to go when preparing the soil for your vegetable garden is to make the soil a good balance of clay, silt, and sand. Ideally, it should be 40% silt, 40% sand, and 20% clay. To test it, you can scoop up soil and form it into a ball using your hand. It should not be too hard as to not crumble when you poke at it, but it should also be sticky enough that it retains its shape even if you don't press it too hard with your hands. 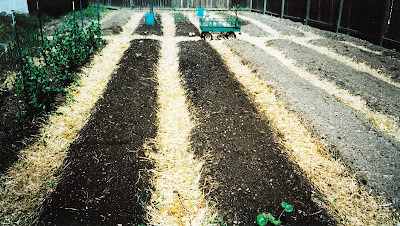 The more traditional way of planting vegetables is laying them out in straight, organized lines. Some people prefer to plant alternating rows of different types of vegetables so that when one type of vegetable is about to be harvested, the rows in between them have vegetables that are not yet in season. The soil structure quickly becomes ruined because gardeners have to walk between rows, though. Building some decorative arches and some tomato cages not only makes your garden look good but also helps it produce more crops. After all, there is more to planting vegetable gardens than just cultivating a spot of land. If you plan to shop for things for your garden online or in a garden store, you’ll notice how many choices there are when it comes to garden structures. Garden structures may vary especially in terms of form and function because they not only are supportive of plants but also make your garden look good. The best kind of garden structure is not only beautiful, but also enhances the health of the vegetables planted there. Plant supports are essential garden structures which is why it’s necessary to use them in the proper way to maximize results. This does not mean building stakes or cages and leave the plant to grow on its own. There are other materials like plant ties, jute cords or twines which you can use to tie up your plant to the cages or poles, just don’t tie them too tight. Society wants to talk about going "green", well I can't think of a better way than to grow a garden. If commercially grown vegetables receive little demand from consumers, then commercial farmers will find no reason to expand their plantations. So there’s no need to cut down rain forests and devastate habitats of wild animals. Also, if demand is lowered farmers will use less pesticide and other harmful chemicals that pollute our rivers and the rest of the environment. You might feel that you as a concerned citizen cannot contribute that much positive impact on the environment by planting vegetable gardens. But imagine the difference made if everyone planted vegetables in their own yard. By the time your crops are ready for harvest, you will notice a change in your body, especially if you look after your garden on a regular basis. Unlike jogging, playing basketball and others, gardening has less impact on your joints. Gardening is best were vigorous exercises is not applicable, such as for people with high blood pressure, heart diseases, bone joint disorders and many others. Many people attest that vegetables grown in their own backyard tastes much better than those bought at grocery stores. They remark how much flavorful their harvests are, whether used as ingredients in a fresh veggie salad or cooked dishes. Be it because of the extra amount of love and care these home-grown vegetables got or the person taking pride in growing crops in his or her backyard, or that they're vine ripened, it doesn’t really matter. What matters is what you serve on the table is fresh right off your vegetable garden and more scrumptious for every member of the family to enjoy. You are also assured that what you put on the table is fresh and free from harmful chemicals like preservatives. With a wheel hoe, the work of preserving the soil mulch becomes very simple. If one has not a wheel hoe, for small areas very rapid work can be done with just a basic hoe. Get at this work while the ground is soft; as soon as the soil begins to dry out after a rain is the best time. Under such conditions the weeds will pull out by the roots, without breaking off. Immediately before weeding, go over the rows with a wheel hoe, cutting shallow, but just as close as possible, leaving a narrow, plainly visible strip which must be hand- weeded. The best tool for this purpose is the double wheel hoe with disc attachment, or hoes for large plants. See to it that not only the weeds are pulled but that every inch of soil surface is broken up. It is fully as important that the weeds just sprouting be destroyed and that the larger ones be pulled up. One stroke will destroy a hundred weed seedlings in less time than one weed can be pulled out after it gets a good start. Use one of the small hand ones until you become skilled with it. Not only may more work be done but the fingers will be saved unnecessary wear. The skillful use of the wheel hoe can be acquired through practice only. Make sure to watch the wheels only: the blades, disc or rakes will take care of themselves. Now for the serious raised bed gardener who wants to save the back, a small tiller can make short work of all this. It will do everything the wheel hoe can do, but with power. It keeps the weeds down and breaks up the soil allowing for oxygen, nutrients and water to feed the plants. The key is that it needs to be small, not only to fit in between plants, but also for lifting into the raised beds. I’ve lifted full size tillers into raised beds before and it’s not easy or pretty. When it comes to small tillers, every gardener knows that the Mantis is the best. It weighs only 20 pounds and works like a full size one. It has a money back guarantee and one of the best warranties in the industry. Besides, if I buy something, I always try to make sure it can be used for more than one purpose and the Mantis can be used not only at the beginning and end of the season, but all throughout. Plus, with all the attachments the Mantis can do a whole lot more. And to sweeten the pot further, right now they’re having a special where I can get you FREE shipping and a BONUS 2 FREE attachments (you save $99). Click the Ad below for details. Composting is a way of getting in touch with nature. Stay away from the chemically enhanced fertilizers at the stores. You can make your own fertilizer through a process known as composting. 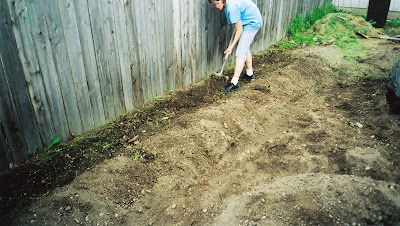 In the process you will probable have the opportunity to get down on your knees and get your hands a dirty, and nothing is dirtier than compost. Compost is the process where biodegradable materials are turned into a soil like substance. The material is mixed with water, air, nitrogen in the proper proportions. The result is a compost material that will serve as a soil conditioner, mulch, and fertilizers. It will feed your garden soil the microorganism that plants need to grow strong and healthy. When starting a compost program it is best to find a spot close to your garden, but some where concealed from plain site. When you show people your beautiful garden you do not want the first thing they see to be your compost heap. They are practical but not very pretty. After you decide on a suitable area you will want to start the pile with green and brown organic materials. Green materials have lots of nitrogen while the brown material contain lots of carbon. These two elements form the basic foundation of a compost pile. A properly formed compost pile will not give off any odors. When the ratio of green and brown materials are correct the pile will not emit any odors. Compost should have an earthy smell and not that of rotting material. If the latter is present then something may be in the pile that should not be there or the ratio of green and brown material is off. Adding some finished compost to the mix helps to kick start the composting process. This will help start the microbial activities in a compost program. Make sure that the pile is moist also. 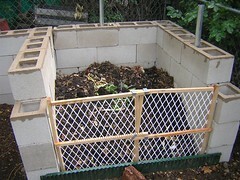 Keeping the compost pile damp will help to quicken the breakdown of the organic materials. Add water to the pile it should be damp like a sponge. Producing compost is really a pretty simple matter. It just takes a little know how and a fair amount of time. This guide to composting for beginners is meant to give you the facts you desire to begin composting. If you would like to learn more visit the Kitchen Composter Blog. Of the implements for harvesting, beside the spade, prong-hoe and spading- fork, very few are used in the small garden, as most of them need long rows to be economical. The onion harvester attachment for the double wheel hoe, may be used with advantage in loosening onions, beets, turnips, etc., from the soil or for cutting spinach. Running the hand- plow close on either side of carrots, parsnips and other deep-growing vegetables will aid in getting them out. For fruit picking, with tall trees, the wire-fingered fruit-picker, secured to the end of a long handle, will be of great assistance, but with the modern method of using low-headed trees it will not be needed. Another class of garden implements are those used in pruning but where this is attended to properly from the start, a good sharp knife and a pair of pruning shears will easily handle all the work. 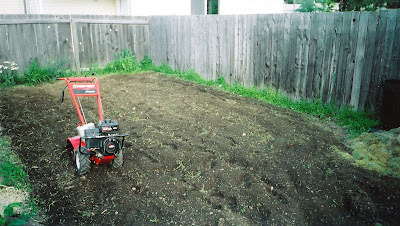 Finally, for the home garden a standard power tiller is usually only used once or twice a year, so it’s not practical to purchase and maintain one, you should just rent. I have seen a group of families co-op one, but I’ve also seen where they all rent one and then split the rental fee. The only exception to this rule is the Mantis tiller, because of its small size it can be used year-round for such things as soil cultivation, etc… Therefore, for the gardener who wants a little help or power, because its lightweight and can be used year-round for weekly garden work, if you can afford it, it makes sense as a purchase. As a final word to the intending purchaser of garden tools, I would say: first thoroughly investigate the different sorts available, and when buying, do not forget that a good tool or a well-made machine will give you satisfactory use long after the price is forgotten, while a poor one is a constant source of discomfort. Get good tools, and take good care of them. As to weeds, the gardener of any experience need not be told the importance of keeping his crops clean. He has learned from bitter and costly experience the price of letting them get anything resembling a start. He/she knows that one or two days' growth, after they are well up, followed perhaps by a day or so of rain, may easily double or triple the work of cleaning a patch of onions or carrots, and that where weeds have attained any size they cannot be taken out of sowed crops without doing a great deal of injury. He/she also realizes, or should, that every day's growth means just so much available plant food stolen from under the very roots of his legitimate crops. 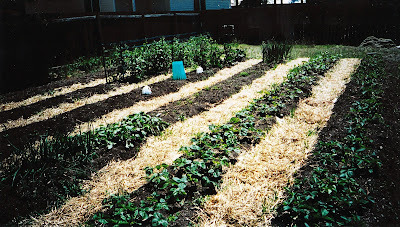 Instead of letting the weeds get away with any plant food, he should be furnishing more, for clean and frequent cultivation will not only break the soil up mechanically, but let in air, moisture and heat all essential in effecting those chemical changes necessary to convert non- available into available plant food. Long before the science, the soil cultivators had learned by observation the necessity of keeping the soil nicely loosened about their growing crops. Plants need to breathe. Their roots need air. . Important as the question of air is, that of water ranks beside it. You may not see at first what the matter of frequent cultivation has to do with water. But let us stop a moment and look into it. Take a strip of blotting paper, dip one end in water, and watch the moisture run up hill, soak up through the blotter. The scientists have labeled that "capillary attraction" the water crawls up little invisible tubes formed by the texture of the blotter. Now take a similar piece, cut it across, hold the two cut edges firmly together, and try it again. The moisture refuses to cross the line: the connection has been severed. In the same way the water stored in the soil after a rain begins at once to escape again into the atmosphere. That on the surface evaporates first, and that which has soaked in begins to soak in through the soil to the surface. It is leaving your garden, through the millions of soil tubes, just as surely as if you had a two-inch pipe and a gasoline engine, pumping it into the gutter night and day! Save your garden by stopping the waste. It is the easiest thing in the world to do cut the pipe in two. 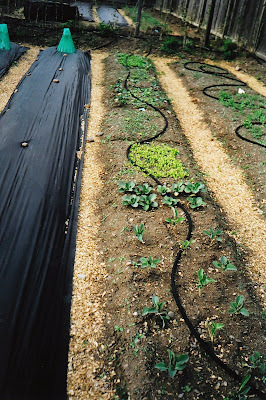 By frequent cultivation of the surface soil not more than one or two inches deep for most small vegetables the soil tubes are kept broken, and a mulch of dust is maintained. Try to get over every part of your garden, especially where it is not shaded, once in every ten days or two weeks. Does that seem like too much work? You can push your wheel hoe through, and thus keep the dust mulch as a constant protection, as fast as you can walk. If you wait for the weeds, you will nearly have to crawl through, doing more or less harm by disturbing your growing plants, losing all the plant food (and they will take the cream) which they have consumed, and actually putting in more hours of infinitely more disagreeable work. I hope you’re convinced by the facts given, to get a wheel hoe. The simplest sorts will not only save you an infinite amount of time and work, but do the work better, very much better than it can be done by hand. You can grow good vegetables, especially if your garden is a very small one, without one of these labor-savers, but I can assure you that you will never regret the small investment necessary to procure it. Here's a couple organic gardening devices and implements used for fighting plant pests. The first and most useful is the covered frame. It consists usually of a wooden box, some eighteen inches to two feet square and about eight high, covered with glass, protecting cloth, mosquito netting or mosquito wire. You can also just create row covers or even just drape see through cloth over the beds. This method also has the additional advantage of retaining heat and protecting from cold, making it possible by their use to plant earlier than is otherwise safe. They are used extensively in getting an extra early and safe start with cucumbers, melons and the other vine vegetables. No Backyard? Try Planting A Vegetable Garden Indoors! Nothing beats the fresh wholesome taste of vegetables freshly picked from your own garden. Planting vegetable gardens can be a challenge if you don’t have a backyard, but you can still grow vegetables indoors. Just follow a few simple guidelines. Plants grow best in high humidity and moderate temperatures. Indoor gardens usually suffer from low humidity and this needs to be addressed. Container grown plants tend to dry out faster and will require more frequent watering. However, it is important not to let the plants get waterlogged as this may cause root rot. Make sure that there is good drainage by raising pots with a pan of gravel underneath. Evaporation from these dishes also improves humidity so they serve a dual purpose. Planting vegetable gardens indoors can be incredibly rewarding, so do not be afraid to give it a try. As human illness may often be prevented by healthful conditions, so pests may be kept away by strict garden cleanliness. Heaps of waste are lodging places for the breeding of insects. I do not think a compost pile will do harm, but unkempt, uncared-for spots seem to invite trouble. Now for the main goal of this post, to point out the critters that you want in the garden, the ones that eat the pest, along with some ideas on how to invite them to watch over your garden. Earth worms: The constant stirring up of the soil by earthworms is an aid in keeping the soil open to air and water. Soil that lacks drainage and air is more prone to insects and disease. Fowls of the Air: Many of our common birds feed upon insects. The sparrows, robins, chickadees, meadow larks and orioles are all examples of birds who help in this way. Insects: Some insects feed on other and more harmful insects. Ladybugs do this good deed and if you don't have them you usually can buy a bag of them at the local garden center. The ichneumon-fly helps too. NOTE: You can buy Ladybugs by Clicking Here. Toads: Toads are wonders in the number of insects they can consume at one meal. The toad deserves very kind treatment from all of us. Each gardener should try to make her or his garden into a place attractive to birds and toads. A good birdhouse, grain sprinkled about in early spring, a water-place, are all invitations for birds to stay a while in your garden. If you wish toads to stay, fix things up for them too. During a hot summer day a toad likes to rest in the shade. By night he is ready to go forth to eat. How can one "fix up" for toads? Well, one thing to do is to prepare a retreat, quiet, dark and damp. A few stones of good size underneath the shade of a shrub with perhaps a carpeting of damp leaves, would appear very fine to a toad. Will cover more tips later. The chances are that you will not find a spot of ideal garden soil ready for use anywhere upon your place. But all except the very worst of soils can be brought up to a very high degree of productiveness especially such small areas as home vegetable gardens require. Large tracts of soil that are almost pure sand, and others so heavy and mucky that for centuries they lay uncultivated, have frequently been brought, in the course of only a few years, to where they yield annually tremendous crops on a commercial basis. So do not be discouraged about your soil. Proper treatment of it is much more important, and a garden patch of average run-down, or "never-brought-up" soil will produce much more for the energetic and careful gardener than the richest spot will grow under average methods of cultivation. The ideal garden soil is a "rich, sandy loam." And the fact cannot be overemphasized that such soils usually are made, not found. Let us analyze that description a bit, for right here we come to the first of the four all-important factors of gardening food. The others are cultivation, moisture and temperature. "Rich" in the gardener's vocabulary means full of plant food; more than that and this is a point of vital importance it means full of plant food ready to be used at once, all prepared and spread out on the garden table, or rather in it, where growing things can at once make use of it; or what we term, in one word, "available" plant food. Practically no soils in long- inhabited communities remain naturally rich enough to produce big crops. They are made rich, or kept rich, in two ways; first, by cultivation, which helps to change the raw plant food stored in the soil into available forms; and second, by manuring or adding plant food to the soil from outside sources. "Loam: a rich, friable soil," says Webster. That hardly covers it, but it does describe it. It is soil in which the sand and clay are in proper proportions, so that neither greatly predominate, and usually dark in color, from cultivation and enrichment. Such a soil, even to the untrained eye, just naturally looks as if it would grow things. It is remarkable how quickly the whole physical appearance of a piece of well cultivated ground will change. With this fact in mind we will not feel restricted to any part of the premises merely because it is out of sight behind the barn or garage. In the average moderate-sized place there will not be much choice as to land. It will be necessary to take what is to be had and then do the very best that can be done with it. But there will probably be a good deal of choice as to, first, exposure, and second, convenience. Other things being equal, select a spot near at hand, easy of access. It may seem that a difference of only a few hundred yards will mean nothing, but if one is depending largely upon spare moments for working in and for watching the garden and in the growing of many vegetables the latter is almost as important as the former this matter of convenient access will be of much greater importance than is likely to be at first recognized. Not until you have had to make a dozen time-wasting trips for forgotten seeds or tools, or gotten your feet soaking wet by going out through the dew-drenched grass, will you realize fully what this may mean. But the thing of first importance to consider in picking out the spot that is to yield you happiness and delicious vegetables all summer, or even for many years, is the exposure. Pick out the "earliest" spot you can find a plot sloping a little to the south or east, that seems to catch sunshine early and hold it late, and that seems to be out of the direct path of the chilling north and northeast winds. If a building, or even an old fence, protects it from this direction, your garden will be helped along wonderfully, for an early start is a great big factor toward success. If it is not already protected, a board fence, or a hedge of some low-growing shrubs or young evergreens, will add very greatly to its usefulness. The importance of having such a protection or shelter is altogether underestimated by the amateur. Sometimes we are much troubled with underground insects at work. You have seen a garden covered with ant hills. This question is constantly being asked, 'How can I tell what insect is doing the destructive work?' Well, you can tell partly by the work done, and partly by seeing the insect itself. This latter thing is not always so easy to accomplish. I had cutworms one season and never saw one. I saw only the work done. If stalks of tender plants are cut clean off be pretty sure the cutworm is abroad. What does he look like? Well, that is a hard question because his family is a large one. Should you see sometime a grayish striped caterpillar, you may know it is a cutworm. But because of its habit of resting in the ground during the day and working by night, it is difficult to catch sight of one. The cutworm is around early in the season ready to cut the flower stalks. When the peas come on a bit later, he is ready for them. A very good way to block him off is to put paper collars, or tin ones, about the plants. These collars should be about an inch away from the plant. Then there are the slugs, which are garden pests. The slug will devour almost any garden plant, whether it be a flower or a vegetable. They lay lots of eggs in old rubbish heaps. Do you see the good of cleaning up rubbish? The slugs do more harm in the garden than almost any other single insect pest. You can discover them in the following way. There is a trick for bringing them to the surface of the ground in the day time. You see they rest during the day below ground. So just water the soil in which the slugs are supposed to be. How are you to know where they are? They are quite likely to hide near the plants they are feeding on. So water the ground with some nice clean lime water. This will disturb them, and up they'll poke to see what the matter is. Beside these most common of pests, pests which attack many kinds of plants, there are special pests for special plants. Discouraging, is it not? Beans have pests of their own; so have potatoes and cabbages. In fact, the vegetable garden has many inhabitants. In the flower garden lice are very bothersome, the cutworm and the slug have a good time there, too, and ants often get very numerous as the season advances. But for real discouraging insect troubles the vegetable garden takes the prize. If we were going into fruit to any extent, perhaps the vegetable garden would have to resign in favour of the fruit garden. The squash bug may be told by its brown body, which is long and slender, and by the disagreeable odour from it when killed. The potato bug is another fellow to look out for. It is a beetle with yellow and black stripes down its crusty back. The little green cabbage worm is a perfect nuisance. It is a small caterpillar and smaller than the tomato worm. These are perhaps the most common of garden pests by name. Will cover more later. If you save seed from your own plants you are able to choose carefully. What blossoms shall you decide upon? Now it is not the blossom only which you must consider, but the entire plant. Why? Because a weak, straggly plant may produce one fine blossom. But just as likely as not the seeds will produce plants like the parent plant. From large seeds come the strongest plantlets. That is the reason why it is better and safer to choose the large seed. The third thing to look out for in seed is viability. We know from our testings that seeds which look to the eye to be all right may not develop at all. There are reasons. Seeds may have been picked before they were ripe or mature; they may have been frozen; and they may be too old. Seeds retain their viability or germ developing power, a given number of years and are then useless. There is a viability limit in years which differs for different seeds, anywhere on average from 3-5 years. From the test of seeds we find out the germination percentage of seeds. Now if this percentage is low, don't waste time planting such seed unless it be small seed. Immediately you question that statement. Why does the size of the seed make a difference? The reasonis, when small seed is planted it is usually sown in bulk. Most amateurs sprinkle the seed in very thickly. So a great quantity of seed is planted. And enough seed germinates and comes up from such close planting. So quantity makes up for quality. But take the case of large seed, like corn for example. Corn is planted just so far apart and a few seeds in a place. With such a method of planting the percent of germination is most important indeed. Small seeds that germinate at fifty percent may be used but this is too low a percent for the large seed. Suppose we test beans. The percentage is seventy. If low-vitality seeds were planted, we could not be absolutely certain of the seventy percent coming up. But if the seeds are lettuce go ahead with the planting. Well, choose your seeds wisely, but get planting, the season is upon us. 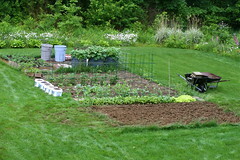 Raised beds are one of the best ways to garden for the home gardener. They allow you to do concentrated gardening, square foot gardening, companion planting, mulching, etc... They're easy to build and relatively cheap. But if you're looking for the cheapest and easiest way to do raised beds and you have the room for it, then raised bed mounds are the way to go. 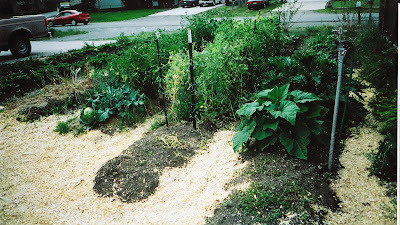 Raised bed garden mounds have all the same benefits of framed beds, but with now cost for materials. You simply create raised beds without the box. Now because there's no frame, it's suggested that you keep them no wider than 3ft across, but as for length, there is no limit. Here's how to build, first roto-till the ground. Then I usually set up some stakes with a string line to keep the beds straight or in this photo we just used the fence as a marker. Once marked, just shovel the dirt to center. Try to form a bed about 3ft wide with a 2ft path between beds. Then just level the top off, the sloping sides are good because they give more surface area to warm the soil (which helps in colder climates) and the experts say that they mimic the natural environment in drainage. 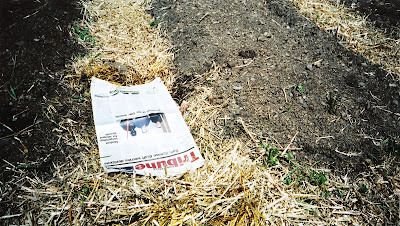 For the walking paths you can lay down old newspapers and cover with straw as seen here. this helps keep the weeds down in the paths and also helps with water retention. Other things you can use are wood chips, I've seen people use old rugs or tarps, pine needles, I even know of person who uses old conveyor belts that they use at gravel pits (he gets them for free when they wear out). Here's a few raised garden bed mounds all done and laid out. Another thing you can do is lay down a breathable black plastic over the mound and just cut holes in it where you plant. Now weeds and water retention is great. Here's some raised garden bed mounds early in the season with all kinds of growth. Here's what they look like in late in the season with all kinds of veggies. Time to go put in a few more plants in. My last post talked about plant friends and foes, which plants like to be neighbors and even thrive around each other, and which ones don‘t. Now let’s talk about when to plant. Here’s a general list of what months to plant certain plants in, although the last frost date for your specific area is more exact. You can usually fined this date out by contacting your local county extension office or talking to other local gardeners. The key is to get your plants or seeds in the ground as soon as possible without damaging them, so you can get the longest possible harvest. This list not all inclusive, but does cover some of the most popular vegetable plants. I personally like to have a printed out copy of this list when I plan out my garden each year. This way I can make sure I‘m getting the plants in the ground a soon as possible to get the longest growing season possible. Also, I can make sure I‘m replanting crops for the next harvest to create "succession planting" (as one comes out another goes in) for the highest yields. My last post talked about plant families, which is a great way to start your planting, but once you understand basic families, there are families that like to be neighbors and even thrive around each other. Learning which plants are friends and which plants are foes is the way to take your garden planting to the next level. The other benefit is that in organic gardening you want to produce a natural environment where your plants thrive and are strongest against insects and disease, putting them with other plants that help their growth is one way to achieve this. This is by no means every plant, but it covers some of the most popular vegetable garden plants. I personally like to have a printed out copy of this list when I plan out my garden each year. That way I can make sure I am creating the optimal growing environment.